A generous amount of sweet and juicy apple chunks are held together by a moist, cinnamon cake in this low sugar apple cinnamon cake. I used the same recipe that I use for the Vanilla Pear Cake in this Apple Cinnamon Cake. 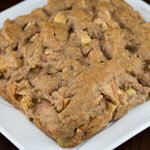 Lots of apple chunks surrounded by a cinnamony cake batter bake up into a delicious dessert. While this cake bakes, it will fill your house with the delicious smells of fall. Preheat the oven to 350 F. Grease an 8-inch round or square cake pan. In a small bowl, whisk together the flour, baking powder, salt and cinnamon. In large bowl, whisk the eggs, oil, milk, applesauce and vanilla. Add the flour mixture to the wet ingredients and stir just until batter is smooth. Mix in the apple chunks. Bake for 35 - 40 minutes until golden on top and toothpick inserted into the centre of the cake comes out clean. Let cool in pan on rack for 15 minutes. Run knife along edges of pan to loosen cake. Turn cake onto rack and invert onto platter right side up. For a sweeter apple cake, replace the 1/2 cup of unsweetened applesauce in the Mildly Sweet recipe above with 1/4 cup sugar. Whisk the sugar in with the eggs, oil, milk and vanilla in step 3. Omit the unsweetened applesauce.